This page goes into technical details of the Mac client software. Please refer to the How it works page for an overall understanding of the functioning of the software. By default, users logging into a Mac are not downgraded from administrator to user, unless the setting "Revoke admin rights" is enabled in the portal and the user is not in the excluded accounts list. The reason all users are not just downgraded right away is because you may have service accounts that you have forgotten to list in the excluded accounts list. Also, if someone cleared the excluded accounts list and saved by mistake, the result would be catastrophic. If the Mac is not bound to an Active Directory, a feature called Last Admin Check kicks in. The purpose of the Last Admin Check is to ensure that you always have at least one administrator account left. If you log in as the last admin, a notice about this will be displayed when clicking the menubar icon. If the Mac is bound to Active Directory, this check is not necessary, as you can always log in with a domain administrator. If you have other system software to manage the Mac and want all administrators to be downgraded at log on, then it is possible to disable the feature. Please refer to LastAdminCheck on the Mac policies page. If a Mac is bound to an Active Directory, all local admin users will be downgraded unless listed in the excluded accounts setting. Admin By Request respects any group defined in the Directory Utility under "Allow administration by" and will not downgrade these users. If no administrator groups are defined, the client will automatically grant administrator rights to users member of the default Active Directory "Domain Admins" group. This is to prevent machines from ending up with no administrator accounts, if the Active Directory binding is now setup correctly. The portal has two levels of settings for mac users. Mac Settings apply to all users by default, unless overridden under Mac Sub Settings. With sub settings, you can define special settings based on Active Directory computer or user groups and/or Organizational Unit(s). This can be used to allow sudo access for developers or automatically approve requests from users in the IT department. 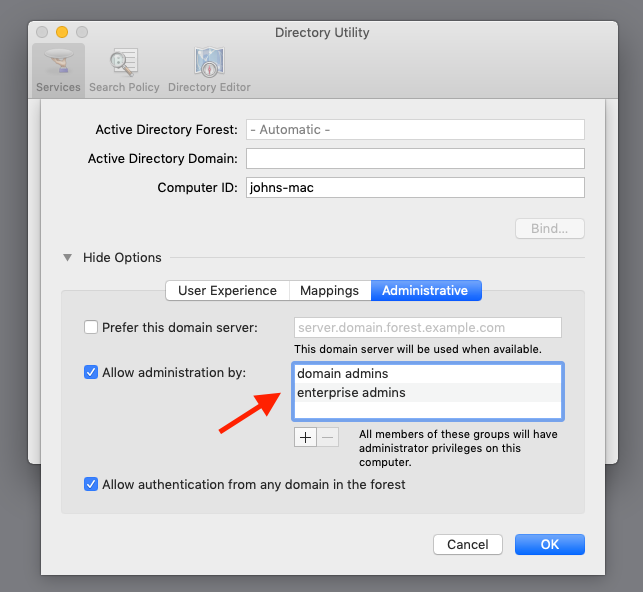 This feature is only available if the mac is bound to an Active Directory or using NoMAD or Idaptive. If a machine is using NoMAD Login and sub settings are defined, users will be asked to login with their Active Directory credentials. This is because the concept of NoMAD is to avoid binding the Mac to an Active Directory and therefore the user need to log in to Admin By Request for the client software to be able to get the groups and OUs needs to login and fetch the groups and Organizational Units to be able to determine subsettings. If you have not used subsettings at all in the portal, the login to Admin By Request will not appear. Idaptive support is currently under development and will work similar to NoMAD. During installation of the client software, an administrator group called "admbyreq" is created and assigned all the rights required for installing software and managing system preferences via the Authorization Database. All local and domain administrators are automatically assigned to this group via the normal system admin group. This is the group that users are added to when elevated to administrator by Admin By Request. For security reasons, sudo access is disabled during administrator sessions by default. This can be enabled in the settings or a policy file (see Mac policies). We do not recommend enabling sudo access unless absolutely necessary. Admin By Requests has checks in place to prevent system tampering using sudo, but due to the root-level access, it is impossible to fully protect against tampering using sudo. Consider using the build-in /etc/sudoers file, if only certain commands needs to be run with sudo. The Admin By Request sudo settings will not override normal /etc/sudoers settings. You can use a local policy file to override all portal settings locally. Refer to Mac policies for more information. Any setting defined in the policy file will override both default and sub settings. The policy file is locked during an Admin By Request administrator session, so users are unable to tamper policy settings. To prevent tampering Admin By Request, it monitors all important files during an administrator session. During a session, access to the to Users & Groups preference panel is disabled to prevent users from adding new administrators. And by default, sudo access is disabled to prevent calling system critical tools and user management from the terminal. The service does also monitor users and groups during the session to prevent tampering, if sudo access is enabled. If Admin By Requests detects that the clock has been changed, the administrator session will be ended instantly to prevent users from extending their session. The command must be run as a local or domain administrator. It cannot be run during a Admin By Request administrator session. Uninstalling will remove Admin By Request files, the abrbyreq group, and reset the Authorization Database. The log folder is hidden by default, but can be accessed by using cmd+shift+g in Finder.app and entering /var/log. The log can also be read using Console.app. If you have questions not answered on this page, please contact us using the chat or the contact menu at the top.